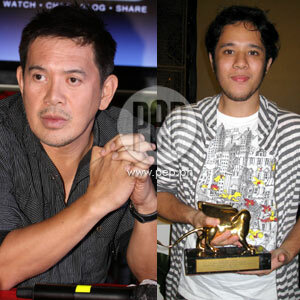 After making waves in Venice, Brillante Mendoza (left) and Pepe Diokno (right) have been chosen to take part in the 50th Thessaloniki International Film Festival in Greece. The Philippines will be the country in focus in a Greek film festival this November. The 50th Thessaloniki International Film Festivalwill hold an "Independence Days"section in honor of Philippine cinema, which has gained acclaim and worldwide visibility in the last few years. It will be held from November 13-22. Guest directors are also expected to attend the 50th Thessaloniki IFF to participate in a roundtable discussion on Philippine cinema and its rise. Last year, the Philippines made a mark in the 49th edition of the Thessaloniki IFF when Sid Lucero and Emilio Garcia tied for the Best Actor award. The Filipino actors won for their outstanding portrayal in the film Selda (international title: The Inmate), which is co-directed by Paolo Villaluna and Ellen Ramos. "It was an honor to have raised the Philippine flag at Venice and we're just overwhelmed to have the chance to keep doing so," says Engkwentro director Pepe Diokno, who will be in Thessaloniki when the film premieres on November 14. The 22-year-old filmmaker was given a tribute dinner by Cinemalaya and the Cultural Center of the Philippines last night, October 7, for winning the Luigi De Laurentiis and Orizzonti (New Horizons) Awards in the Venice International Film Festival. Diokno was also given a plaque signifying that Engkwentro was the recipient of the Special Jury Mention Award in this year's Cinemalaya Cinco. PEP (Philippine Entertainment Portal) asked Direk Diokno about his experience in Venice and he revealed that he already got a hint that they would win even before the awarding ceremony. "For the first award, they tipped us just on that day. They said, 'We need you in the awards night coz the judges liked the film.' So we went in the afternoon and we accepted the first award. I thanked the FDCP [Film Development Council of the Philippines] and my school for letting me take a week off. "Then at night, they didn't tell us at all so when they were reading the citation, they cited it for the bravery, novel storytelling, and the technical achievement of the film. Then sabi namin, 'Baka hindi tayo nanalo.' The ceremony was in Italian so we couldn't understand anything, so when they said Engkwentro, sabi namin, 'Ano?'" Pepe Diokno is finishing his Film and Audiovisual course at the University of the Philippines in Diliman, Q.C. His film Engkwentro will be screened on October 21 at Market! Market! as part of the 11th edition of Cinemanila. Meanwhile, Direk Dante (Brillante Mendoza's nickname) has directed seven films in four years and he is the first Filipino director to compete in Cannes (for Kinatay) and Venice (for Lola) in the same year. He made headlines worldwide when he was chosen as Best Director in Cannes and for being the surprise entry in Venezia 66. In an interview with PEP during the PLDT WatchPad event last Wednesday, Direk Dante shared that he himself was pleasantly surprised to enter two of the top three film festivals in the world, the other being the Berlin International Film Festival. "Every year, ang Venice, naglalagay sila ng parang surprise entry, hindi talaga nila sinasabi 'yan, kahit kanino. In fact, we asked if we can at least announce it in the Philippines kasi sabi ko, 'We're so proud since this is only the second time na magkaroon ng surprise entry after 25 years sa main competition.' During the press conference, according to the producer, nung pinalabas daw yung list, ipinakita yung Center Stage Production Philippines, nagpalakpakan daw ang mga tao. Na-surprise talaga sila, kasi from the Philippines. Nung nakita nga yung pangalan ko, lalo silang [nagulat], kasi siyempre, hindi nila ine-expect. From Cannes tapos biglang meron ka rin entry sa Venice." This marks the first time a Filipino film competes in Venice for the Golden Lion in 25 years. The last entry was Mike de Leon's Sister Stella L. (presented under the title Sangandaan) in 1984. Direk Dante's Lola is the opening film of the 2009 Cinemanila, which will kick off on October 15 in Taguig City. According to the official website of the Thessaloniki IFF, these chosen films "illustrate their country's various realities, deal honestly with its past and stand out as fresh, non-conformist cinematic voices, creating films that are radical in content and form." It is interesting to note that The Muzzled Horse Of An Engineer In Search Of Mechanical Saddles will be screened in Greece with the live music accompaniment of The Brockas, a band composed by Khavn De la Cruz, Diaz, John Torres and the producer Mei Bastes.